Peter B. Villella is an Associate Professor of History at the University of North Carolina at Greensboro. His research centers on the indigenous peoples of colonial Mexico and the contributions of its leaders to Mexican intellectual and legal history. His project as a 2018-19 Fellow with the National Humanities Center charts the genesis and evolution of the idea of a shared “Aztec past” among indigenous, mestizo, and Spanish intellectuals in Mexico in the late-sixteenth century. Devastated by new diseases and severed culturally from their ancestral heritage, a distinct antiquarianism arose among some Nahua leaders in central Mexico who sought to recover and study old artifacts to regain an understanding of their pre-Hispanic past. Their sources were fragmented and contradictory, yet by creatively reassembling and reinterpreting what was available, the Nahua historians and their sympathizers and collaborators “constructed” the Aztec epic, a proud new way of understanding Mexican antiquity that would eventually form the basis for one of the modern world’s great national stories. Villella, Peter B. “‘For So Long the Memories of Men Cannot Contradict It’: Nahua Patrimonial Restorationism and the Law in Early New Spain.” Ethnohistory 63, no. 4 (2016): 697-720. 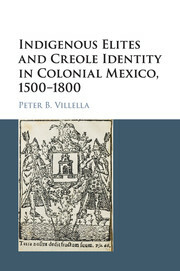 Villella, Peter B. Indigenous Elites and Creole Identity in Colonial Mexico, 1500–1800. Cambridge, UK: Cambridge University Press, 2016. Villella, Peter B. “The Last Acolhua: Alva Ixtlilxochitl and Elite Native Historiography in Early New Spain.” Colonial Latin American Review 23, no. 1 (2014): 18-36. Villella, Peter B. “Indian Lords, Hispanic Gentlemen: The Salazars of Colonial Tlaxcala.” The Americas 69, no. 1 (2012): 1-36. Villella, Peter B. “‘Pure and Noble Indians, Untainted by Inferior Idolatrous Races’: Native Elites and Blood Purity in Late-Colonial Mexico.” Hispanic American Historical Review 91, no. 4 (2011): 633-63.